Cricket All-Stars (better known as Cricket All-Stars Series) was an exhibition Twenty20 cricket series took place in the United States in 2015. The series features two lineups of renowned retired cricket players from around the world, led by cricket icons – Master Blaster Sachin Tendulkar of India and the King of Spin Shane Warne of Australia. The All-Stars Series is a set of games played between Sachin's Blasters led by Sachin Tendulkar and Warne's Warriors led by Shane Warne. The inaugural series was held across three cities in the United States. The second series was announced to be held in September/October 2017. The two captains selected their respective squads by randomly drawing out the player names on 5 November 2015 at Times Square. All three matches of the series played in baseball stadiums. 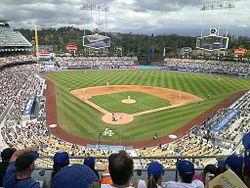 Initially in June 2015, Wrigley Field in Chicago and Yankee Stadium in New York were booked as venues, along with Dodger Stadium in Los Angeles. However, in October 2015, the former two venues were replaced by New York Mets' home ballpark Citi Field and Houston Astros' home ballpark Minute Maid Park. The first match was a day game in New York, while the second and third played under lights in Houston and Los Angeles respectively. A curator from New Zealand was hired to prepare drop-in pitches in Minneapolis to be delivered to the three stadiums. Marais Erasmus from South Africa who is currently a member of the ICC Elite Umpire Panel and Simon Taufel and Steve Davis from Australia who were former (now retired) members of the ICC Elite Umpire Panel are the three experienced umpires who were selected to perform the duties of the on-field umpires and the third umpire in all the three games on a rotation basis. Warne's Warriors won the toss and elected to field. Sachin's Blasters won the toss and elected to field. Sachin's Blasters won the toss and elected to bat. The All-Stars Trophy and team shirts were unveiled by Tendulkar and Warne along with their respective team's player rosters, on 5 November 2015 in Times Square, United States. ^ "USA All-Stars tour gaining momentum". cricket.com.au. Retrieved 27 October 2015. ^ "Warne confirms all-star cast for 2017". cricket.com.au. Retrieved 27 November 2016. ^ "Tendulkar-Warne's Cricket All Stars series confirmed". Deccan Chronicle. Retrieved 27 November 2016. ^ "Tendulkar to play alongside Lara in Cricket All-Stars". ESPNcricinfo. Retrieved 6 November 2015. ^ "Warne confirms booking baseball venues for all-star T20s". ESPNcricinfo. Retrieved 27 October 2015. ^ Della Penna, Peter. "Tendulkar-Warne exhibition T20s in November". ESPNcricinfo. Retrieved 27 October 2015. ^ "Warne helps Warriors to All Stars Win". Cricket.com.au. Retrieved 15 November 2015. This page was last edited on 25 March 2019, at 17:10 (UTC).